Hi Friends: Here in the Midwest, it's been near record-breaking weather, so I stepped outside to take pictures on this bright sunny day. Here's a card using a cute digital stamp from SheepSki Designs - she has some lovely images. I saw these shoes and just had to get out my Spectrum Noir Glitter Brush pens! Hope you enjoy! Print image onto smooth white cardstock and color with Glitter Brush Pens, Spectrum Noir Markers, and Zig Brush pens (black fine lines). Fussy cut the images. For background, cut panels from the paper packs to fit an A2 card base and center panels. Distress and ink all edges. 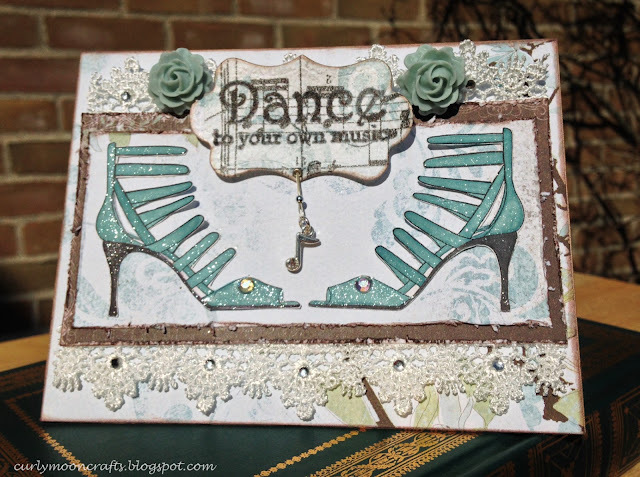 Add lace behind the center panels and adhere to card base. Glue shoes to center panel and add gems to the shoes. Add self-adhesive gems to the lace. Collage some of the music notes from the Tim Holtz tissue wrap to a piece of the Fronds paper and stamp the sentiment on it with black ink. Cut the sentiment with the tag die, ink edges, then add the eyelet at the bottom. Add the wire and music note to the stamped "sign" tag, then add to the card with foam squares. Finish with matching resin flowers next to the sentiment sign. Your card is so pretty. I love the way you used lace around the edges. Great design too. Thanks for joining us on the Simon Says Stamp Monday Challenge.